As excited as we are for the start of the 2016 NFL season, we’re equally excited for college football to begin. We’re not naive; we understand that the game at this level is not as “pure” as we would like it to be — in the end, it’s still all about the money — yet when we see fans around the country gather together in support of their respective schools, we can’t help but get hyped for the upcoming season. Many folks insist that the season doesn’t actually begin until the opening day kickoff. We beg to differ. For us, the season starts when the official preseason rankings come out. Now that the Associated Press has released its preseason Top 25, we can’t help but take a moment to examine this first set of rankings. With that in mind, here’s a look at the top 10 teams heading into the 2016 college football season. The last time we saw Notre Dame on the football field, it was not a pretty picture for Irish fans. Ohio State overpowered Brian Kelly’s squad 44-28 in the Fiesta Bowl, and All-American Jaylon Smith suffered a career-altering knee injury. With the new season fast approaching, the Fighting Irish, like many other teams, are looking forward to a fresh start in 2016. But it won’t come without its difficulties. Despite being ranked No. 10 in the preseason AP poll, Kelly recently dismissed safety Max Redfield and suspended cornerback Devin Butler indefinitely — the only two seniors on the squad — as they were two of six Irish players to be arrested this past weekend. On top of that, as we saw last season, trying to navigate a two-quarterback system is never easy; something Notre Dame will attempt to do with DeShone Kizer and Malik Zaire. As the Fighting Irish prepare to kick their season off against Texas on Sunday, September 4, we’ll know soon enough if they’re among college football’s true contenders or just another high-profile pretender. Following a 2015 campaign that saw the Tennessee Volunteers finish with a 9-4 record and a No. 22 ranking in the AP poll, Butch Jones and company enter the new year ranked No. 9 in the preseason poll, the program’s first time being ranked in the preseason top 10 since 2005. Given the talent and experience on this roster, we could be looking at a Tennessee team that’s finally ready to live up to expectations. 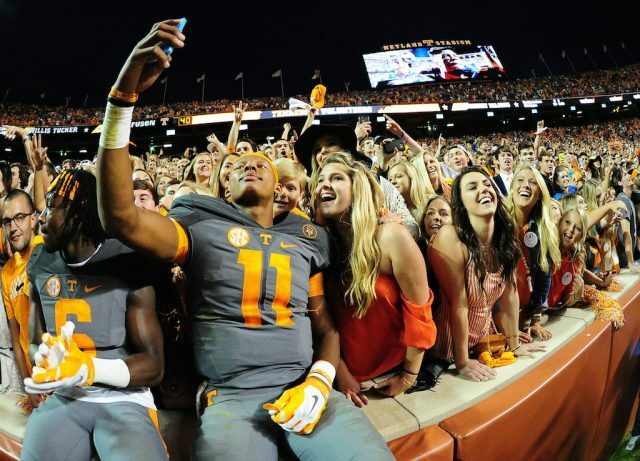 Entering the 2016 season, the Volunteers are the favorites to win the SEC East and projected to win 10. 3 games. This team features a veteran QB in Josh Dobbs, a two-headed monster in the backfield in Jalen Hurd and Alvin Kamara, and a stout defense featuring multiple players with first-round potential. Now’s not the time to sleep on Tennessee. The Volunteers are poised to make moves in 2016. With former quarterback Kevin Hogan now suiting up on Sundays, the Stanford Cardinal still must decide which QB will be starting under center in 2016. Under normal circumstances, this would be cause for concern. However, luckily for head coach David Shaw, he still has a not-so-secret weapon up his sleeves: Christian McCaffrey. In 2015, the All-American running back broke Barry Sanders’ single-season record for all-purpose yards, ending the year with a mighty 3,864 total yards on his way a second-place finish in the Heisman Trophy standings. It’s one thing to know that Stanford plans to get the ball in McCaffrey’s hands as much as possible, it’s a whole other thing to actually stop the superstar from making plays once this happens. Best of luck to anyone who has to go up against the McCaffrey and the Cardinal — you’re going to need it. In 2015, Jim Harbaugh’s first season as Michigan’s head coach, the Wolverines went 10-3, thumped Florida 41-7 in the Citrus Bowl, and finished the year with the No. 12 ranking in the AP poll. More importantly, however, after three seasons of lackluster football, the program was once again relevant. For that, Harbaugh had more than earned his lofty paycheck. Now it’s time to see if he can help the team take that next step in year two. 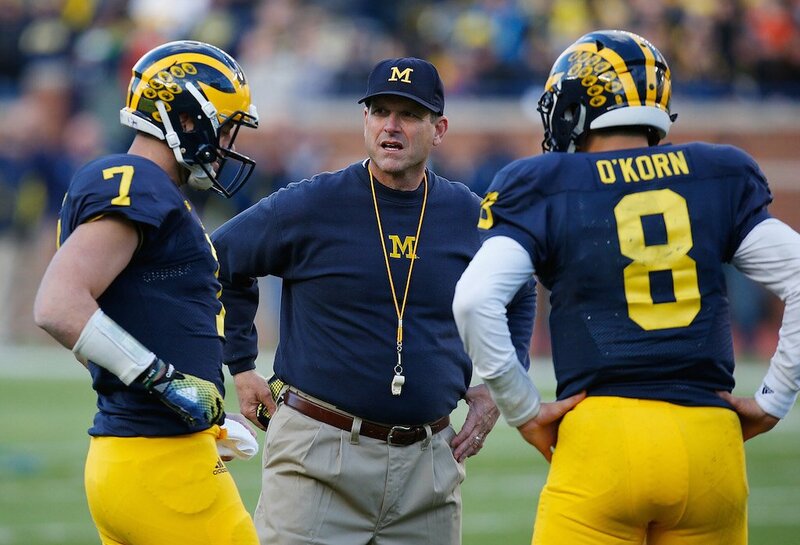 Entering the 2016 campaign, not only are the Michigan Wolverines ranked No. 7 in the preseason AP Top 25, they also earned one first-place vote. Talk about a step in the right direction. With another strong group on the defensive side of the ball, an offense that’s more familiar with its coaches style of play, and the swagger that comes with being the first college football team ever to rock “Jumpman” gear, we believe the Wolverines are well-equipped to tackle the Big Ten and beyond. 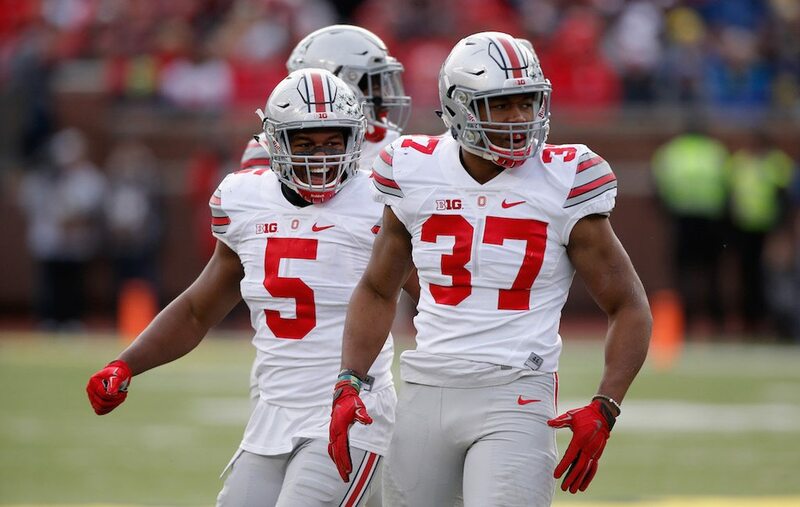 Despite losing a lot of key players to the NFL, including running back Ezekiel Elliott and defensive end Joey Bosa, the Ohio State Buckeyes are still expected to do big things in 2016. For us, the key to their success begins and ends with returning quarterback J.T. Barrett. Barrett enters the year as the unquestioned leader of a young Buckeyes team that managed to earned one first-place vote and is ranked No. 6 in the preseason AP poll. We have a strong feeling that coach Urban Meyer will lean heavily on his dual-threat QB as he looks to lead Ohio State back to the top of the college football mountain. Regardless of how things play out, these Buckeyes should be fun to watch in 2016. After starting off the 2015 season 7-0, the LSU Tigers lost three of their last five games, finished with a 9-3 mark, and settled for the No. 16 spot in the AP poll. But 2016 gives Les Miles and company, who are ranked No. 5 in the preseason AP Top 25, a chance for some sweet redemption. All eyes will no doubt be on running back Leonard Fournette. During his sophomore campaign last season, Fournette rushed for 1,953 yards, 22 rushing touchdowns, and finished sixth in the Heisman voting. In what is expected to be his final year at LSU, you better believe the All-American will look to better his individual numbers as well as the Tigers overall standing in college football. 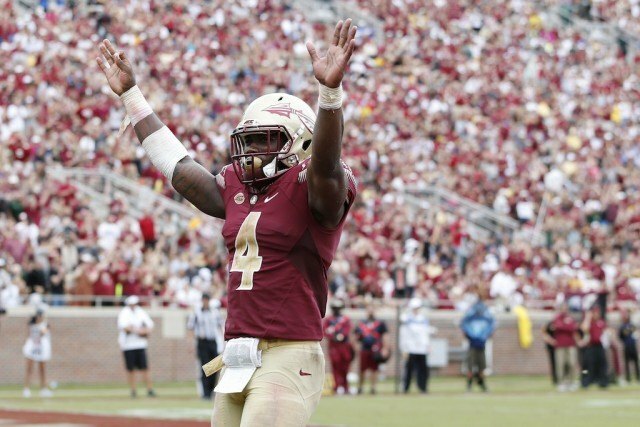 There may be a lot of question marks surrounding this year’s Florida State team, but there’s one position this group should feel mighty confident about: running back. With Dalvin Cook in the backfield, who’s poised for another monster year, the Seminoles start off 2016 season ranked No. 4 in the preseason AP poll, earning an impressive five first-place votes in the process. We can’t wait to see what head coach Jimbo Fisher is able to do with this group. Although Oklahoma’s 2015 season ended in disappointing fashion, falling 37-17 to Clemson in the Orange Bowl, 2016 offers the opportunity to build off a campaign that saw the Sooners put up 43.5 points per game (4th of 128) and finish with an 11-2 mark. With Bob Stoops calling the shots and quarterback Baker Mayfield running the show, we have complete confidence in this team’s ability to make it happen. The Sooners secured four first-place votes in the preseason AP poll and currently sit as the No. 4-ranked team in the country. Still, this is no time to celebrate as the Sooners will kickoff their 2016 campaign against a formidable Houston Cougars team, ranked No. 15 in the preseason AP Top 25. The last time we saw the Clemson Tigers take the field, they fell just short of winning a national championship. Coming into the 2016 season, the expectations remain the same for Dabo Swinney and company. The way we see it, this team will only go as far as quarterback Deshaun Watson can take them. Watson may have thrown for 4,109 yards and 35 touchdowns while adding another 1,105 yards and 12 scores on the ground last season, but the Tigers still felt short of their ultimate goal in 2015. This time around, Clemson starts the year as the No. 2-ranked team in the country, securing 16 first-place votes to go with it. You know what they say: If at first you don’t succeed, try, try again. To be the best, you have to beat the best. As expected, that spot belongs to the Alabama Crimson Tide. Following a victory over Clemson in the CFP National Championship, the Tide finished the 2015 season with 14-1 record and the No. 1 ranking in the country. In 2016, Nick Saban and company, after earning 33 first-place votes, will begin the year where they ended — at the top of the college football mountain. This team may have lost a lot of talented players to the next level, but if we’ve learned anything about Alabama, it’s that players in this program know how to grow up quickly. Expect more of the same in 2016. Statistics courtesy of SR/College Football and ESPN.